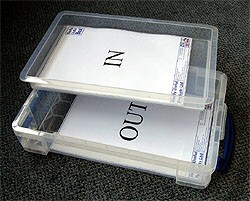 These trays are 375 x 310 x 90 (length x width x depth in mm). 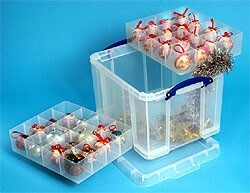 They are available with either 6, 12 or 16 compartments. 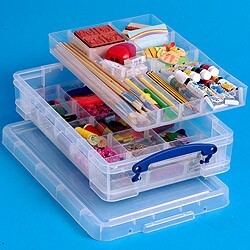 These trays are 375 x 310 x 45 (length x width x depth in mm) and are designed for cutlery, make-up, craft or office supplies. 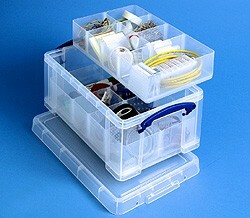 Like the other large trays, these trays fit inside the 11, 11 XL, 18, 20, 21, 21 XL, 35, 35 XL, 50, 64, and 84 litre boxes (see above). 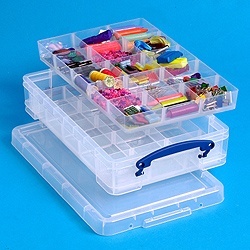 This tray is ideal for storing and separating small items like paperclips or beads, etc. 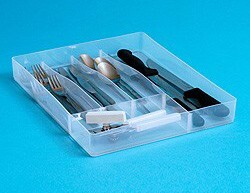 The tray compartments are approximately 65 x 68 (mm). This tray is double the height of our normal trays. 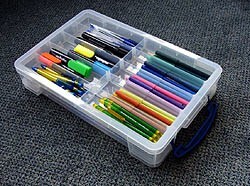 The organisational slots have been designed for normal pen lengths. The slots sizes are 167 x 37 x 30 (mm).